Video and audio by Lucie Rutherford. Used with permission Part of HHS Media, Harrisonburg High School’s coverage of students, faculty and staff lined up to show solidarity with Marjory Stoneman Douglas High where 17 died in a shooting Feb. 14. Knowing how to prepare and work with audio in covering protests, walkouts. SPRC member Vince DeMiero and junior Marianne Nacanaynay of TheHawkeye.org talk about solutions to audio issues. Student newspapers – the new papers of record? Nearly 350 teachers wearing white T-shirts, chanting slogans and holding signs calling for a fair contract lined the front of the high school before the September school board meeting. Philadelphia’s television news vans were there: Action News, Fox 29, CBS 10. And so was the local paper, the school newspaper, the only print media present. As local and regional newspaper circulation continues to decline, there is less and less local coverage for more and more communities. Residents of areas without the local paper sometimes have to look long and hard to read about what’s happening in their own backyards leaving them in the dark about most community matters including politics, policies and police activity. Because of this lack of local press, student journalism is now more important than ever. While the regional TV stations may air a 15-second voiceover on the nightly news about a local happening, the school newspaper can tell the full story and often is the only media outlet doing so. The school newspaper has become the paper of record for many areas. Good student newspapers are authoritative and cover the local community unlike other media. Because of protected speech, they can be editorially independent. The result is fair and balanced reporting with high standards for news gathering and writing, paying close attention to accuracy in detail and fact-checking. The paper and its online presence are publicly available not only to the immediate school but through distribution to local merchants and public buildings, like libraries and municipal offices. That night of the school board meeting, four student journalists covered the event, arriving at 6 p.m. and staying until the meeting adjourned at 9 p.m. They shot video and stills. They interviewed parents, teachers and students. They listened, recorded and took notes. They were present to document the entire event. The week prior and the week after the meeting they contacted school board members and union representatives, reached out to attorneys representing each side, researched past contract negotiations, learned about process, past and present. The result was an informative and timely news story that objectively told both sides – a story that informs the community, both the school and municipal stakeholders, what is happening in their local school district. Student journalists’ news media matter. They mean more than ever to their school and surrounding neighborhoods because oftentimes they are the only voice of authentic and honest local news coverage. They have become the paper of record. Titled Fencing Out Knowledge: Impacts of the Children’s Internet Protection Act (CIPA) 10 Years Later, the report also argues those children most affected are the poor, who might not otherwise have unfiltered Internet Access if they cannot access it at school. JEA’s Scholastic Press Rights Committee would like to see how journalism programs currently fare in today’s filtered high schools. We urge you to complete the linked survey to see what your schools filters block, either for your students or for other classes in your school. Students surfing the Web themselves or interviewing others who do can provide students with a worthwhile experience in news literacy as they become informed about information availability and how that affects society’s knowledge and ability to act on that knowledge. We hope this survey will gather enough representative information to allow JEA and others to design strategies to help journalism programs work in a less filtered environment. This lesson plan by Lori Keekley can add structure to your searching. Each student or adviser should complete a separate form. “For speech class, senior Dave Jennings needed to find information about Nirvana and Kurt Cobain,” Maggie Beckwith, senior reporter for the Lakewood Times, began her story on the effects of Internet filtering. Beckwith went on to study journalism at Syracuse University and interned at the Student Press Law Center. Internet filters continued blocking legitimate sites. Since then, groups have challenged the effectiveness of Internet filters as educationally unsound and operations for prior review and censors that set up barriers and taboos instead of educating you, according to a fact sheet on The Free Expression Policy Project website. To raise awareness of overly restrictive blocking in schools and school libraries of legitimate, educational websites a nd academically useful social networking tools, The American Association of School Librarians has designated Wednesday, Sept. 24 as Banned Websites Awareness Day. AASL asked school librarians and other educators to promote an awareness of how overly restrictive filtering affects student learning as part of Banned Books Week. As part of that recognition, JEA’s Scholastic Press Rights committee will conduct a national survey of the impact of Internet filters beginning that day and last a week. We invite you and your students to take part in the survey by going to jeasprc.org and accessing the survey information there. The commission asks students and advisers to test their Internet filters to see if their filtering goes beyond what filters are charged with blocking by the Children’s Internet Protection Act as numerous studies and groups have argued. When information has been gathered, SPRC will report on the survey’s results and share that data. Please check the committee’s website, its Facebook page or JEA’s Facebook page Sept. 24 for access to the survey. 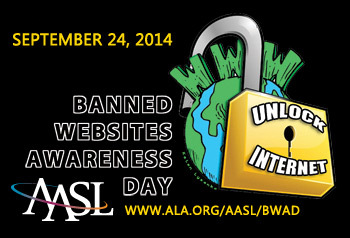 To raise awareness of overly restrictive blocking in schools and school libraries of legitimate, educational websites and academically useful social networking tools, The American Association of School Librarians has designated Wednesday, Sept. 24 as Banned Websites Awareness Day.